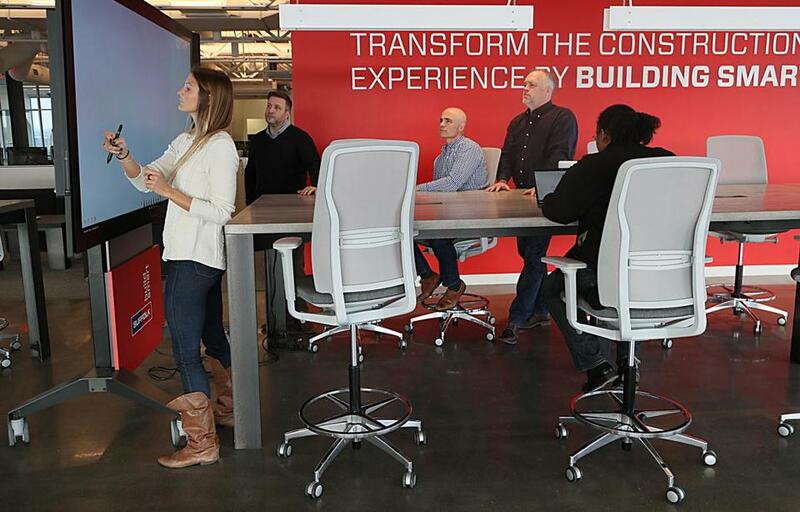 New office space at Suffolk Construction includes collaborative areas. When the Boston data analytics firm Humanyze moves into its new office this spring, one of the key innovations will be something decidedly low-tech: a coffee machine that can be moved to compel different co-workers to cross paths. 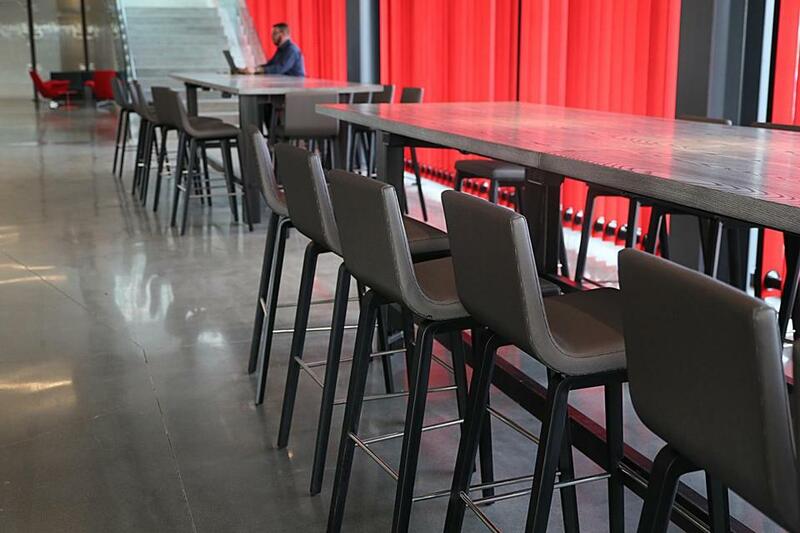 At Publicis Groupe’s Boston headquarters, currently under construction, each floor has a themed lounge area — one has a Ping-Pong table that converts to a conference table — to encourage employees from the communications conglomerate’s six brands to visit other floors and build relationships that will breed more collaboration. Technology is increasingly allowing employees to work in isolation — either from home or wherever they happen to be. And the proliferation of open offices is driving more people to wear headphones to escape the din and to communicate over e-mail or Slack to keep their conversations private. The number of disconnected contract workers and solo on-demand jobs is also on the rise. While these new models of work have brought benefits — increased flexibility and speed, to name a few — they are also creating what former US surgeon general Vivek Murthy calls an “epidemic of loneliness.” All this solitude is bad for business, it turns out, and employers are trying to overcome it by promoting more face-to-face interactions among employees. Studies show that even casual conversations among co-workers can lead to greater productivity by improving morale and strengthening relationships. Social connections also lead to higher-quality work, improved creativity, better decision-making, and healthier workers. The peer pressure of hearing how hard a fellow employee is working can also be a motivating factor, research has found. The answer, Harris said, often lies in promoting interaction. Companies are assigning people from the same team to different floors to create more inter-departmental encounters. They are widening corridors to encourage conversation, and putting whiteboards at the tops of stairs and other places where people tend to gather. And yes, they are positioning the coffee machine in a strategic fashion. New office space at Suffolk Construction includes open, shared seating in the cafeteria to help promote more face-to-face interaction among employees who may work in isolation. And now that we can measure the effect of people bumping into each other, companies are paying attention to how this can improve their bottom line. While Waber was at the MIT Media Lab getting his doctorate, he helped develop a wearable sensor that can measure communication among co-workers by detecting where they are, whom they’re talking to, how stressed they are, and how much interest and influence they have in the conversation. The device doesn’t record conversations, but instead captures inflection and tone of voice by analyzing audio signals in real time. And as Humanyze prepared to move into its new office, the company used this technology to study its own communication patterns. When it became clear that casual conversations around the coffee machine sparked innovation and helped form relationships, Waber decided that in the new space, the coffee machine would be on wheels in order to put it where it’s needed most. If, for instance, the engineers are working on a project that involves the product team, the coffee machine can be placed between the two departments. And whether the people gathered there to talk about work or what they did over the weekend, Waber said, this mingling will ideally lead to more communication, and, ultimately, better, faster results. When the construction giant Suffolk was designing a 38,000-square-foot addition to its Roxbury headquarters, it analyzed e-mail and phone traffic to see which teams collaborated the most and could benefit from being located next to each other. But it also looked at more insular teams, such as risk management, and put them at the core of its new open space in order to encourage greater interactions with co-workers. The company also put all the conference rooms in one place to ensure that different groups, such as tech specialists and job-site superintendents, bump into each other before and after meetings. “You almost force engagement,” said Kim Vaughan, Suffolk’s chief marketing officer. This increased circulation of employees, plus an open floor plan, makes it easier to wave someone over to join an impromptu meeting if a question arises, Vaughan said. These in-person encounters not only save time, but they also develop co-worker relationships that wouldn’t have happened over e-mail. Julia Imbalzano, a 22-year-old learning and development specialist at Suffolk, said the new layout may have even helped advance her career. A month after the new addition opened in the fall, Imbalzano was working at a high-top table on the third floor when the chief innovation officer walked by and stopped to ask her about working on a new company initiative. Before Imbalzano knew it, she was the project manager — something that might not have happened, at least not so quickly, if she’d been stuck at her desk. Chief executive John Fish is also more visible now, sometimes holding client meetings out in the open, and employees have told Vaughan they like seeing him more. At Takeda Pharmaceuticals’ headquarters in Cambridge, it’s the scientists that the company wants other employees to connect with, dispersing them among administrative, IT, and operations departments in the hopes that they will learn more about the research driving the organization, said Harris of Perkins +Will, which designed the company’s building. Scientists from different disciplines are also mixed together. The labs are in the center of the building, enclosed in glass, which allows employees to see inside, outside, and through the labs and be more inclined to connect in person. The glass also adds a “figural and psychological transparency” that promotes the sharing of ideas, Harris said. The designers also paid attention to where people naturally pause — at corners, outside meetings — and made room for chairs and whiteboards there. Karuppiah Kannan, director of drug development management at Takeda, has found himself hashing out issues with co-workers as they wait to go into adjoining conference rooms. A lab worker he happens to run into can tell him the results of a test, for instance, without a flurry of time-consuming e-mails. Stairways can also help connect people, said Elizabeth Lowrey, a principal at Elkus Manfredi Architects, which designed the Publicis Groupe and Suffolk buildings, provided they are wide enough to allow people to walk side by side when someone is coming the other way. “You lose the personal connection as soon as you step behind somebody,” Lowrey said. Lowrey is transforming a suburban office park that will encourage interaction among all its tenants. She’s proposing that different buildings have specific food offerings open to all office park workers — a cereal bar in one, a lunch spot in another, and an array of candy in a third — to generate destinations that will provide a sense of community.